For reasons of efficiency the Automated Geographic Reference Center has gone by the acronym AGRC since its inception in the early 1980's. AGRC is the State of Utah's map technology office and is located in the north office building of the State Capitol. For reasons of time efficiency, general fitness, and personal preference, on a typical day, 3 to 6 of the 13 staff members make the commute to work by bicycle. Throw in 3 staff who commute by bus and train daily, and AGRC has a low parked-car-to-employee ratio with few rivals. There's something oddly complementary about maps and bicycles. There's obviously plenty of technology that goes into making quality, light, comfortable and durable bicycles. There's also a lot of technology that goes into building digital mapping (a.k.a GIS) resources, doing geographic analysis, and providing map-based web services like aerial photography, interactive maps, and a high-precision GPS base station network (more info at gis.utah.gov). And of course bikes and maps go together as ‘bike maps'. AGRC has been asked to advise the Governor's Outdoor Recreation Director on working with local government and other trail stewards, to compile a statewide map layer of bike trails and routes. Proximity, to use a fancy geographic term for short distances, is a huge advantage for bike commuting and the AGRC biking crew live between 2 and 7 miles from the Capitol. Certainly not everyone can locate themselves this close to work but, when possible, it makes a difference. The Capitol has a secure, weather-proof bike storage locker (for a $10 key deposit) and has showers and low-fee gym lockers. The leadership of the Department of Technology Services (DTS), AGRC's parent organization, has run a year-long challenge to increase carpooling and alternative transportation usage in response to Governor Herbert's clean air initiative. Lastly, the state health insurance options, like many others, offer a small incentive for those who exercise regularly and stay fit which is enough to cover the cost of a bike tune or two every year. AGRC staff spend a lot of time coordinating with other state and local government agencies with similar map technology interests. Despite the advent of video conferencing, that means a fair amount of driving to meetings. DTS has one shared fleet car which helps. But another strategy occasionally used by AGRC staff is to drive in a bike in a personal car early in the week and leave the car over night and bike home and back for next day or more. A brief survey of AGRC staff revealed some other interesting tips. • Consider several potential bike commuting routes, what's the fastest route? What's the safest route? What's the most pleasant/scenic route. Use these as needed but mix it up a bit too. Familiarity is good for safety but variation is good for the brain. • Routes with stop signs tend to be faster and have less and slower traffic than those with signals. • Ride defensively with 110% focus. Don't stake your life on cars seeing you or stopping at cross streets where you have the right of way, especially when drivers are late or have a coffee or phone in their hands. • Focus is key. Headphones and daydreaming are not advised. • Plan to get cut off or treated rudely somewhat regularly. Responding with anything but a smile and a wave just increases your risk and aggravation. Let it go and get back to enjoying the ride. • Cold weather often makes for better bike commuting because it's easier to regulate your body temperature by de-layering during the ride. • Lights. lights. lights. lights. (front, rear, helmet, spokes). • The IRS's 2014 standard mileage reimbursement rate is 56 cents per mile. Reward yourself for riding by the mile and invest accordingly in comfort, safety, and style. • One AGRC staffer added bike commuting to his daily routine and subtracted car ownership as a part of a lifestyle change that led to losing 80 pounds in just over 6 months. • Knee-high wool socks and battery-powered, frame-wrapped Christmas lights are signature winter riding gear for one AGRC commuter. 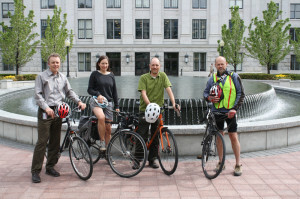 • Long before working at AGRC, one staffer attended a single Salt Lake City Mayor's Bicycle Advisory Committee meeting and penciled in the 2nd and 3rd Avenue bike lanes as a suggested addition to the master plan. Despite moving several times and changing jobs, he's still using these lanes on almost every commute. • One AGRC staffer, has a very limited selection at the bike stores as he's over 6′ 8″ tall. • Last fall, bike commuting wasn't enough for one staff member who took a week off to do a self-supported bike trip to Yellowstone National Park and back. He was an object of curiosity for several State Capitol commuters who recognized him as he pulled his trailer through Bountiful in driving rain during morning rush hour. • To date, AGRC bike commuters have, knock on wood, no major accidents or moving violations on their records. • Favorite bikes: Bianchi Valle, Surly Cross Check, Salsa Vaya, a 1992 Kona Explosif, Trek Soho (belt-drive, internal gearing).